Where should you place the cell booster’s indoor antenna? Why, where you need it. Of course it’s a little more complex than that. Really it depends on the use you’re going to have for the booster, and how powerful it is. Remember that the coverage estimates from cell booster companies can be a little optimistic, and they prefer to talk about power levels instead of coverage. That’s because the construction of your home or office has a lot to do with the amount of stuff in your walls as well as the overall construction of the home. Copper wires in the walls make it hard for cell signals to get through, and some sorts of faux finishes can have a real effect on cell signals as well. If you’re using one of the smaller 55dB or 65dB boosters, it’s best to presume that you’ll get the best use out of them when you’re in the same room or in the room next to where the booster is. Most of these boosters come with small antennas that are intended to be placed on a desk or somewhere near the intended use point. That’s the best thing to do — put the antenna on a desk, credenza or dresser where it has a good view of the area where you want boost. Despite the pleas of your significant other, resist the urge to put it behind a door or put a picture in front of it. Sure that means it will be visible but it will also be a lot more useful. If you’re using a larger 70dB or stronger booster, you’ll get coverage that can extend through the entire home and that means you’ll want to plan a little bit where to put the antenna. It’s best to choose a location on the ceiling that’s centrally located in the home and yes, you do want to put it on the ceiling because that’s where it’s going to do its best work in radiating all throughout the house. If it’s a two-story house, I’d put the antenna upstairs so that it can radiate down, but remember that you do want 15 vertical feet of separation between the outdoor and indoor antenna so you can get maximum power. That may be hard to achieve with the antenna on the top floor and it may mean that you’ll have to put the outdoor antenna even further up on a mast. 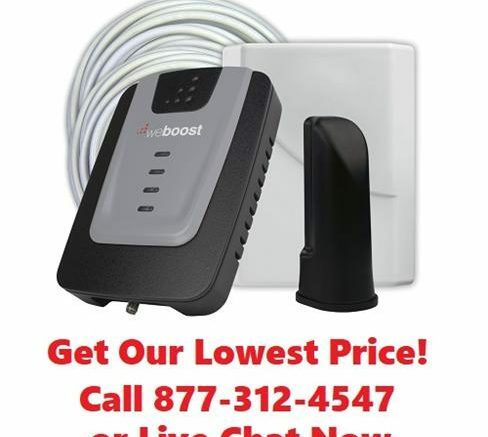 Call us at Solid Signal at 877.312.4547 and we can talk to you about the best cell booster solution for you and even recommend add-on kits that can allow you to have multiple antennas in the home for the best possible coverage. We have a wide variety of products and our team can put together the best solution for you. CES2015: Wilson Electronics announces weBoost! UPDATED: If your phone can make calls over wi-fi, do you still need a cell booster?